Headlice Information, remedies and games. I was hoping not to have to start yet another page on the subject of getting rid of headlice but as it doesn't seem to be going away I thought I should. As I have said many times before, the cheapest and most effective way to get rid of this problem is still plenty of conditioner, a fine tooth comb and lots and lots of patience. I just want to clear something up: black people CAN get hair lice. maybe they're less likely to, but it happens. I'm black, have a-little-past-shoulder-length hair, and it's thick & quite curly/frizzy, and this spring is the 2nd time I've had lice. 1st time was last winter. I don't know where it came from and at first of course I washed and washed my hair, not realizing that this makes it even easier for them to stay b/c it's easier to attach to clean rather than dirty/oily hair. It is especially difficult to comb those little metal combs through thick curly hair, but you've got to take time and do it the best you can because you know how persistent those pests are! Anyway,I just don't want anyone to be careless or think they're untouchable, because anyone can end up with a case of headlice, no matter who you are. It really should be made clear on your site, in case parents are panicking....Head lice do NOT live in your mattress or woollens! nits are NOT laid anywhere other than hair, just could not survive off the head - No way could they live in clothing/mattresses or anything else for up 3 months as suggested!! I have just come to what I think is the end of my battle with head lice. I cannot tell you how horrific it was! Over a two month period I tried using three chemical shampoos (permethrin, pyrethrin and an enzyme product called Resultz) a large number of the ideas from your website and other sources (vinegar, mineral oil, vinegar and mineral oil, tea tree oil shampoo, tea tree oil, cetaphil, olive oil, mayoinnaise, Denorex, T-gel, etc) and nothing rid us of the problem. I also spent many, many hours trying to comb them out with various lice combs - some from the packages, a long-toothed metal one, and a short-toothed green one. I spoke with the director Katie at Lice Solutions multiple times and she was extremely helpful and kind, and kept in touch until we were lice-free. She runs a non-profit organization and they have a clinic that you can actually go to and they will remove ALL of your lice and nits. They treat hundreds of people every week. In any case I am in Canada and not Florida, USA, and so I needed long-distance help. 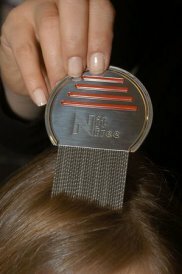 The main thing that Katie recommended, and that I want to share with everyone, was to use a lice comb called The Terminator. *** My local drugstore ordered one for me and there is no way to describe how much better it is than any other comb I have ever seen or used. The tongs are long so you can comb through long or thick hair, it is all metal, the tongs are set very very close together, and in addition to that each tong of the comb has little grooves in it all the way up that help catch the nits and lice and also damages them. This is the tool everyone needs to have!! At the clinic there they also use a product called Not Nice to Lice by Ginesis (there are 2 products with the same name I think) - this is a non-toxic product and I had my drugstore order it too, and of all the products I used it was the most effective at actually loosening the nits from our hair so they can be more easily combed out. Also, Katie says that when you comb the hair initially you must make rows that are paper-thin or you will miss some eggs - this took me six hours on my daughters thick hair but is worth it. After you get out everything you can find you do not need to comb as much and can take larger pieces of hair when you do. We treated ourselves with the Not Nice to Lice product (use the mousse as you must not get it in your eyes) and then used the Terminator comb for about two weeks and I think we are done with lice, or very close to it. Katie examined samples we sent from our hair - except for one damaged, non-viable nit everything that we sent that we thought were eggs were just hair debris, and so we should be able to just comb for 2-5 minutes 2x per week to stay clear now. Well, I really liked reading the various solutions on your website - I never did try the quassia root or the neem oil. Thank-you. I really do want to help other people with this problem as there is no way to describe what we have gone through trying to get rid of them. I hope that you can post the information about the Terminator Comb and the Not Nice to Lice Mousse as that is what helped me, and they are tried and true products and methods that Lice Solutions uses every month on hundreds of people with excellent results. All of the sites that warn against the toxic shampoos say to comb out the eggs, but that is just not possible with most combs on the market- this comb is heads and tails above them. 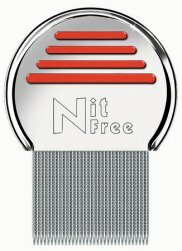 This NitFree comb is sometimes available on prescription from your GP or from any prescribing health visitor, nurse or Pharmacist - It is listed in Part IXA (Appliances) of the current Drug Tariff as the Nitty Gritty NitFree Steel nitcomb with microgrooved teeth. I believe this product is called Assy 2000 in Europe. My daughter has been battling lice for months. she has a full time job and two children under 5, she was at her wits end, then we found your website. we went down and bought the Cetaphil and a trial size bottle of Listerine just for back up. I put a few drops of the Listerine in the Cetaphil started massaging it into my granddaughter's scalp and before I was done with one section of hair, they were dead! We got a shower cap so we can leave it on over night and it is the first dosing. but after I comb through her hair should be the deciding factor. Also Listerine has a mild acid in it and the nits are falling out. and just a few drops so we don't have to worry about the alcohol so much, of course it will be washed out asap. Please note - it is not recommended to mix various products as this can sometimes create adverse effects and reactions. Listerine is an alcohol-based mouth rinse and, as such, is not sold as a head lice treatment. As Listerine contains about 27% alcohol should there be any open sores or abrasions it will burn the scalp as well as eyes, nose, and mouth on contact. I would like to thank you for your web site. I had only battled head lice on my daughter for a week with Rid and Nix creme rinse, when I was tempted to cut her very long, thick, wavy hair off. Thankfully I gave the internet one more try and found your web site. I read through the suggestions about Denorex and Paul Mitchell Tea Tree Oil. I am grateful. It worked. I used the extra strength Denorex and then put on generic Paul Mitchell Tea Tree Oil conditioner for two hours. I was surprised out how many lice I combed out of my daughter's hair. The next morning there were no lice in her hair and I was able to manually remove the remaining nits. This evening I used the same method and absolutely nothing was combed out of hair. The lice lost, my daughter gets to keep her hair. Thank you. I would have never have tried either of the hair products for lice without having read about these. 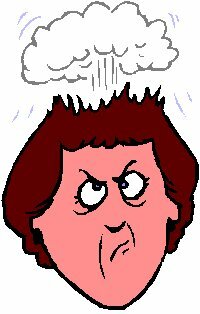 I have just read your page on headlice/nits. Being from Australia I haven't heard of some of the products mentioned by others. In any case, as a mother of 6: 3 boys-3girls, my skin just crawls at the site of a louse/nit in my kids hair! I have recently been battling the war of headlice, not the 1st time and I'm sure not the last. I have tried herbal remedies bought from the chemist, I find the nit combs useless, I have tried a mixture of apricot kernel oil and kerosene, tried vinegar etc and the list goes on. There is a product here in Australia called KP24. It is available with a blue or pink label attached to the bottle. Go the pink, don't ask me, I just know it works better than the blue label. This is so easy an application. A few mls massaged into the hair and scalp, to a foam, leave in for 5 minutes and repeat. I have actually seen the little blighters work their way to the top of the foam as I massage and they are dead, well at least they aren't moving!! This is no cure for the removal of the eggs and as most people who have had dealings with headlice are aware, there is nothing that kills the unhatched eggs. I have yet to try the conditioner to loosen the eggs but here is how I have found the best way to remove them from long hair and your sure they are gone. 1. Section dry hair into 4. A part from the mid forehead straight down to the nape of the neck, then from one ear across the top of the head to the other. Tie the sections with hair bands. 2. Starting at the nape of the neck with one section, make a part, left to right, separating a FINE section. 3. THOROUGHLY search for eggs. These can be white if they are hatched or greyish/brown if still incubating these filthy parasites. Look for them anywhere along the hair shaft starting right in close to the scalp. Sometimes the glue they are attached with loosens and they can be found 3 inches or more down the hair shaft so look the whole length. 4. Using the thumb nail against the tip of the index finger, pull the egg the length of the hair shaft and off the end. CHECK your nail tip and index finger to be sure you have the egg out. 5. Flick the offending egg into a bowl of HOT water as you go. Don't submerge your finger in the water because others already floating will end up on your finger too! 6. Tie the egg free section of hair separately and start again. Dispose of the eggs/water how you see fit, hell why not just flush them with the s**t where they belong! Nit combs pull the kids hair out sometimes and that can hurt. Three year olds end up crying and don't really understand you didn't mean it. By sectioning the hair off you AND your child can take "breaks" from the tedious task. I have heard people say finding the eggs in blonde/fair hair is hard. This is true, but also true for darker hair. The reason being the different colour of the eggs according to whether or not they have hatched. Those who have boys, don't think having a quick number 2 with the shears is a fixed remedy, it's not. I have shaved my boys heads and there have been eggs attached to the tips of the hair!! So by all means, shave their heads, but still LOOK for eggs. Good Luck to you all I sympathise with you. Thanks to PO for this contribution. 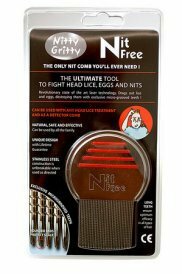 I have had to deal with head lice for 12 years now about 18 months ago I came across a comb, aptly called NIT FREE. It wasn't cheap but it is very effective, not only clearing the lice and nits but also the empty white egg cases. I have tried shampoo's which worked wonders for several months and bought all the usual lotions ( against the advice of my GP... who says the chemicals in these were banned from use with cattle over 25 years ago!!) and in the end unless everyone treats their children, they will return. This is not a problem that is going to vanish over night. Combing takes time and I hate it but it doesn't hurt as I condition my childrens' hair well and my children are after all "worth it"
I have been dealing with head lice in my family since October, 2002. It is now June, 2003. I have tried everything. I bought otc shampoos of every brand. I found, especially with my daughter, there were still live bugs after using the shampoo. I was told by a pharmacist, that the shampoo's aren't working well anymore and must be left on for double the recommended time. I tried leaving rid on for 30 minutes and still live bugs!! I have tried, Vasoline, beer, vinegar, lamp oil (only on myself for fear of what it would do to childrens' scalp). My mother always swore by Kerosene, but I am not ready to be that desperate yet. I called my doctor, after spending over $300.00 on otc treatments. I was told they do prescribe Kwell(Lindane) for head lice but, since it is a dangerous medicine, they wanted me to try a home remedy instead. I was told to mix 4 cups of mineral oil with 2 cups of apple cider vinegar. Soak hair with mixture. Rap hair with plastic wrap and leave for at least one hour. Use Dawn dishsoap and then regular shampoo. Of course, this only works if you use the fine tooth comb to get rid of eggs. I did try this and it seemed to work fairly well. There were a few bugs hatched, but I may not have gotten them all combed out. Also, a friend of mine swears by mayonnaise and a shower cap left on over night. I have never tried this, but he says it works every time and is inexpensive. Use baby oil to saturate hair, let that soak in for half an hour or so, then shampoo. Then comb out what is left of the lice. This really works. I TOO HAVE BEEN FIGHTING A LOSING BATTLE WITH HEADLICE. MY DAUGHTER HAS RECURRING AND I GUESS, RESISTANT CRITTERS. I'VE TRIED EVERY OTC REMEDY, TEA TREE OIL, MAYONNAISE, AND EVEN OLIVE OIL. AFTER VISITING YOUR WEBSITE YESTERDAY AND READING ABOUT EXTRA STRENGTH DENNOREX, I RUSHED UP TO THE LOCAL DRUGSTORE AND GOT SOME. I WASHED MY DAUGHTER'S AND MY HAIR WITH THE DENNOREX, AND LIKE ANOTHER LADY, THE LICE WERE DEAD AND FALLING OUT OF OUR HAIR AS I SIMPLY COMBED. THANK YOU TO EVERYONE WHO SUBMITTED INFO ABOUT THE DENNOREX. I TRULY BELIEVE THAT WE WILL FINALLY BY LICE FREE. I'M SO TIRED OF WASHING ALL OF THE BEDDING AND EVERYTHING DAILY AND IT'S SO EXPENSIVE TO KEEP REPLACING PILLOWS AND BRUSHES AND COMBS. ONCE AGAIN, THANK YOU, AND I DO RECOMMEND THIS TREATMENT TO ANYONE HAVING A PROBLEM WITH LICE. The oldest child had gotten it when she was 5 and it just went from bad to worse from there. The poor child had lice for 10 yrs! A friend of mine came over last fall and asked if her daughter could stay the weekend at our house ... I reluctantly told her no and explained why. She surprised me by saying to me ... Listerine! I looked at her and said "what you want me to gargle before I treat their heads?" She said no silly, use Listerine "ORIGINAL" Mouthwash! It cannot be the minty or other flavors. The yucky yellow stuff! So here is what I did ... I bought one bottle of Listerine ... cost was about $4.00 and shower caps! I thoroughly saturated all heads and put a shower cap on them. They wear this to bed. When you wake up in the a.m. all lice are dead and almost all of them are in the cap. The nits are dead too! I did the treatment again the next night and almost all of the nits were gone, save for two that I verified with our local Health dept. that they were definitely DEAD! 48 hrs, 1Bottle of Listerine Mouthwash, and a shower cap and my kids have been lice free for a year now! The one draw back to this was that no matter how many times a day you washed their hair it smelled like mouthwash for over a month! What a wonderful price to pay to be lice free! I think I'd rather smell like mouthwash any day then to ever experience lice again! CeeJay writes - "I have suffered with head lice over the past 8-10yrs whilst at school i found a very effective form to get rid of lice and this was full marks mouse althought it does not kill the eggs i dont think many products/remides do. i moved into my sisters house an during that time i got lice again but did not realise because i was suffering with very bad dandruff i was told that a ver good form of gettin rid of dandruff was to use T/Gel shampoo to my amazement the shampoo also killed the lice as the day after i used it i was massaginf my scalp to try and see if there was any dandruff ant found an egg i sat for hours try to find a live head louse and didnt. as for the eggs all u need is good old patients a good nit comb and a large bottle of cheap conditioner or mayo and a friend/relative to sit for a few hours and help u comb the eggs out once u have finished ad u are certain that there are no more eggs rinse ur hair with a vinegar and water solutin this is to help rinse away the conditoner and mayo then wash ur hair with t/gel shampoo. for the next 7 days rinse ur hair with water and vinegar solution to make sure there are no surviving eggs comb your hair with a fine tooth comb then 3-5 days after that start the whole process again then again the following week. i know this is a grueling long process but it really is worth it patients and more patients headlice will not go away with one treatmeant like this over night because it takes upto 8 days for an egg to hatch and they can live for upto 3 weeks and female lice can lay upto 6 eggs a day u do the maths." As a professional lice debugger and nitpicker I want to make sure people are aware that Denorex or any product that has Salicylic Acid (a form of aspirin) SHOULD NOT be used on children! IMPORTANT - Hints and Things does not necessarily endorse or recommend any or all of the suggestions contained on these pages. We would never recommend the use of pet shampoos, kerosene, etc., especially on children. They may well get rid of the lice but can be dangerous and may call health problems in the future. Professional advice should be sought before use.